Spring has arrived with abundant color, and a spirit of renewal has spread across the Salem campus. I write this spring-term community letter to give you an update on the progress we have made this semester. With commencement but a matter of weeks away, I congratulate our Academy seniors on the success of their applications to outstanding colleges. We are especially proud that, for the thirteenth time since 1975, the University of North Carolina at Chapel Hill has awarded an Academy graduating senior the prestigious Morehead-Cain Scholarship. I also congratulate our College seniors on their acceptances to outstanding graduate and professional programs and to highly competitive positions of employment. Following an admissions cycle in which we enjoyed 12 percent increases in enrollment at both the Academy and the College (and thereby set a new record in the College), every indication we have this spring suggests that we can anticipate that next year will be another year of excellent enrollments at both the Academy and the College. We will also welcome into the Salem College community a number (as yet to be finalized) of Sweet Briar College students. I thank our Academy and College faculty and staff for their dedicated service in providing our students with a stimulating experience both in and beyond the classroom. As an institution devoted from its inception almost 250 years ago to the value of learning, we must continuously strive to offer our students the very best academic programs and facilities. To that end, we have taken several important steps in recent months. I am delighted to announce that we will reintroduce German into the curriculum next fall, and that it will be available to both Academy and College students. Furthermore, at its meeting on April 7, the faculty of Salem College voted unanimously to reintroduce the study of both Latin and Greek at the College in the fall. We will also introduce a visual literature concentration for the art history major, and we will add an accounting major for the bachelor of science in business administration (BSBA) degree. The Academy will expand its already challenging curriculum by including Introduction to Programming, Honors Latin IV, and Advanced Placement (AP) Spanish Language next year. We have also made the study of the sciences and mathematics a top priority at both the Academy and the College, and we have established the construction of a new sciences and mathematics building and the renovation of existing science facilities as two of the most important goals of the Women of Purpose $60 million capital campaign. In December, when we publicly announced the campaign, we had raised $26 million. I am pleased to report that as of April 1, we had reached a total of $30.4 million. Thanks to the generous support of Salem alumnae and friends and the outstanding work of Campaign Co-chairs Rebecca Hewit Rauenhorst C’74 and Jennifer Reinhardt Lynch A’77 and the Campaign Steering Committee, we are bringing our major campaign priorities ever closer to realization. These priorities include capital and technological infrastructure improvements, support for faculty and for academic programs, scholarships, and annual financial growth. Thanks to the generosity of two anonymous donors, the biology and environmental studies wing in the new sciences and mathematics building will be named for Salem College alumna and Trustee Lucy Rose C’76, and the new College residence hall, the construction of which is progressing with extraordinary speed, has been named the McHugh Sisters Flats. We have also received commitments for a lecture classroom; the Mathematics, Science, and Technology Tutoring Center; and one of the graduate and work-study areas in the new sciences and mathematics building; the lily pond plaza in front of the student center; the great room in the McHugh Sisters Flats; and a portion of the new tennis facility that is in the planning stages. In addition, we have received gifts for other campaign objectives, including Academy dormitory renovations and technology upgrades, scholarship support for eligible students, organ restoration, and capital improvements across the campus. We appreciate the generosity and support of every Salem alumna and friend who has contributed thus far to the Women of Purpose campaign. We have more to accomplish, and I encourage you to visit the campaign website (purpose.salem.edu) for more details about the progress of the campaign and for information regarding the various ways in which you can contribute to it. Every contribution of any size will be warmly welcomed. 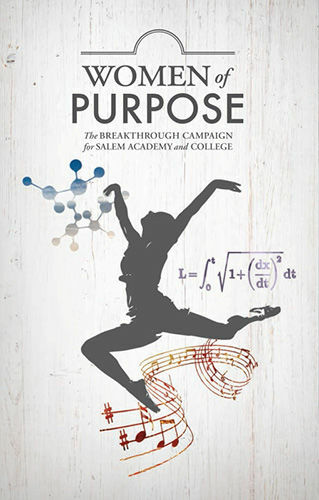 We will launch theWomen of Purpose campaign regionally in the coming months. Thanks to the extraordinary work of Trustee Margaret Pike C’94 and the Presidential Transition Committee, I have traveled throughout the Southeast this year on the Salem Evertour. In the coming months the Salem Ever tour will continue in New York City; Washington, D.C.; Roaring Gap, Atlantic Beach, and Winston-Salem, North Carolina; Hilton Head and Charleston, South Carolina; and Savannah, Georgia. I treasure each opportunity to learn from our alumnae about their experiences at Salem and about their aspirations for the future of our beloved institution. The twentieth presidential inauguration will take place in the May Dell on Founders Day, April 24, 2015. I hope to see many of you there. If, however, you are unable to attend, I invite you to watch the ceremony, which we will stream live on our website (www.salem.edu/inauguration) at 2:00 p.m. that day. I am sincerely grateful to Gwynne Stephens Taylor C’72 and the members of the Inauguration Committee for their assiduous planning of the week’s celebratory events and for their attention to every aesthetic and practical detail. I hope to meet many more alumnae and friends of Salem either during Reunion Weekend or at one of the stops on the Salem Ever tour. It is an honor to serve as president of this extraordinary institution, and I look forward with optimism to working with the entire Salem family in the years ahead as we continue to take bold steps to ensure a brilliant future for Salem Academy and College.